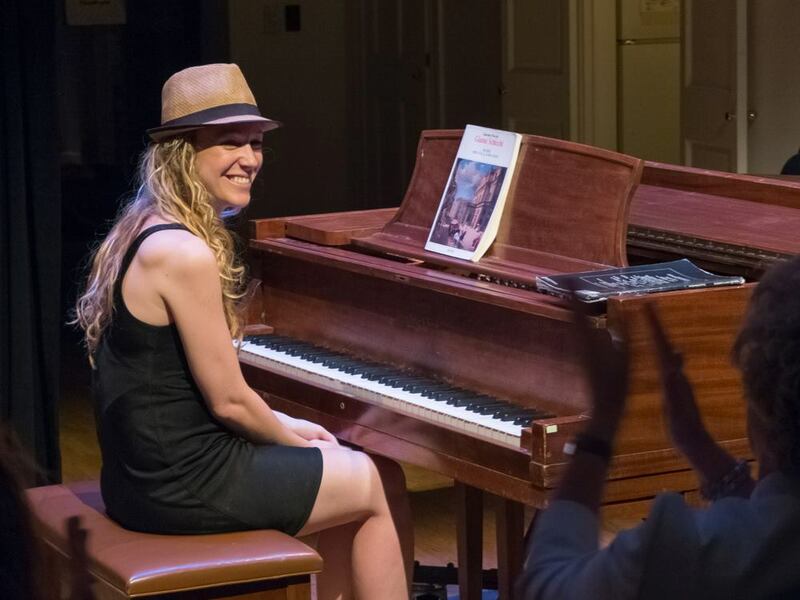 The silvery voice of Jenai Huff combined with the critically acclaimed singer/songwriter Eugene Ruffolo in a performance of two original tunes written by Jenai and one by Eugene. Eugene followed with a song written in Italian, which will be part of his next CD scheduled to be released in the fall. His beautiful timbre and romantic language delighted the audience. From the moment Yvonne Cassidy began to read from her latest novel How Many Letters Are in Goodbye? she held the audience spellbound. Cassidy read the first letter from the novel title, a letter from seventeen-year old Rhea Farrell to her mother, Allison who died when Rhea was only three. Writing from Penn Station, Rhea begins to share with her mother her homeless experience but quickly lapses into questions she has always had, questions she wants her mother to answer. Judging by the book sales at the intermission, the audience members too, were keen to find out the answers to these questions! For anyone who didn’t get their hands on a copy, click here. A delightful new presence on the music scene in New York has arrived from the heart of Europe, the city of Prague. 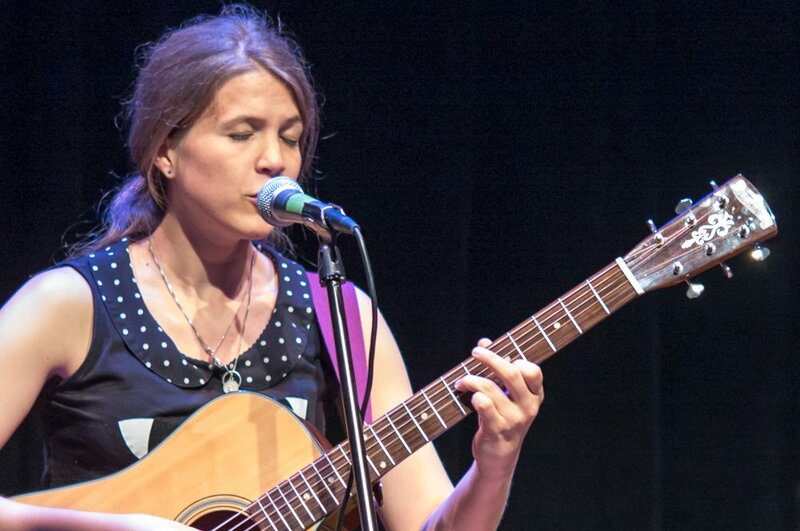 Martina Fiserova’s humor and energy shone through her music and lit up the room. Her soulful authentic approach delivered an emotional urgency; even a melancholic story felt uplifting. The exciting chord work she does sets her apart from being “just another girl with a guitar.” We need more of these European invasions. Dan Yurkofsky premiered two song compositions from his new CD, Hoverhill. The songs, titled “The Time Zone” and “Walking” featured Mr. Yurkofsky’s melodic singing voice and contemplative lyrics. He was deftly accompanied by two fine musicians, Matt Turk on acoustic guitar and Noah Hoffeld on cello . To learn more about Hoverhill, and to hear listening examples from the CD you can click here. First time performer, Kathleen Bennett Bastis’, opened the second half of the show with an hilarious and “spot on” perspective of internet dating. 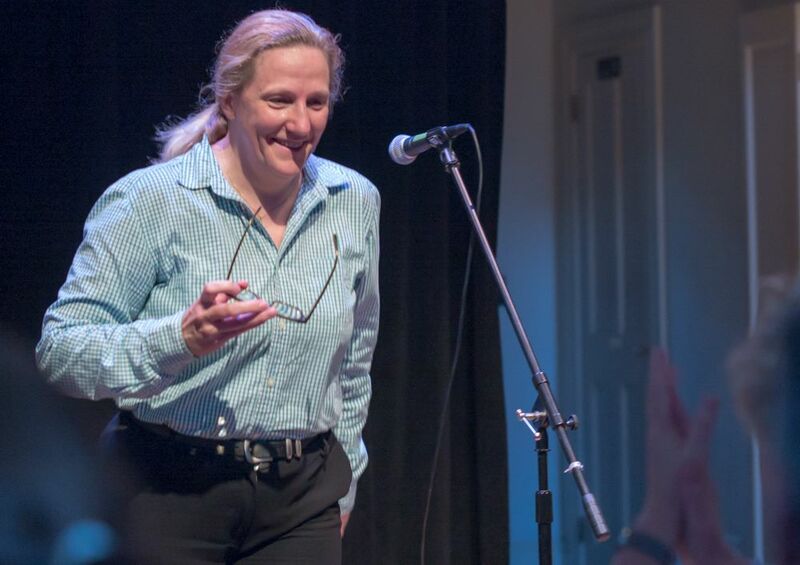 Kathleen claimed that this was the first time she had been on stage since she performed in Scheherazade in fifth grade; hard to believe given her poise, charm and insouciance. “As always, a terrific evening of great entertainment and talent,” Kathleen said after the show. Ashley Bell was next and she dazzled all with a stirring rendition of the opera staple, “O Mio Babbino Caro.” She followed up the showstopper with an original composition, which showcased her lower register and displayed another level of her vocal instrument. Digital poet and recent NYU grad, Allison Fichtelberg dazzled the audience with a spellbinding performance of her epic poem “Scroll.” I am honored to have performed for such a receptive audience and to share the space with such talented artists. That was the first performance I’ve done where I summoned the appropriate chutzpah to make the concluding sword trick work.” (You’ll have to see her perform live to understand that comment.) An absolutely mesmerizing performance. But Allison wasn’t done for the night. Lyndon Achee, steel drummer and percussionist began with a piece dedicated to his sister Beatrice who died of breast cancer. Lyndon than circulated a bag of instruments—tambourines, maracas, drumsticks and bells–through the audience who accompanied Lyndon in an upbeat tune, which ended with Allison coming back on stage and dancing to the sweet sounds of a steel drum. A wonderful, highly spirited, ending to a great night.